Organizations must manage a continuous deluge of data that originates from numerous sources. Today’s competitive environment demands that this data form the foundation on which business decisions are made. This leads to another issue, how does an organization ensure the accuracy and integrity of this data? Inaccurate data will lead to inaccurate decisions which could negatively impact organizational efficiency, customer confidence or the company’s bottom line. This is the problem domain that Microsoft’s Data Quality Services (DQS) is designed to address. DQS provides the following features to resolve data quality issues. • Data Cleansing: the modification, removal, or enrichment of data that is incorrect or incomplete, using both computer-assisted and interactive processes. For more information, see Data Cleansing. • Matching: the identification of semantic duplicates in a rules-based process that enables you to determine what constitutes a match and perform de-duplication. For more information, see Data Matching. • Reference Data Services: verification of the quality of your data using the services of a reference data provider. You can use reference data services from Windows Azure Marketplace Data Market to easily cleanse, validate, match, and enrich data. For more information, see Reference Data Services in DQS. • Profiling: the analysis of a data source to provide insight into the quality of the data at every stage in the knowledge discovery, domain management, matching, and data cleansing processes. Profiling is a powerful tool in a DQS data quality solution. You can create a data quality solution in which profiling is just as important as knowledge management, matching, or data cleansing. For more information, see Data Profiling and Notifications in DQS. • Monitoring: the tracking and determination of the state of data quality activities. Monitoring enables you to verify that your data quality solution is doing what it was designed to do. For more information, see DQS Administration. 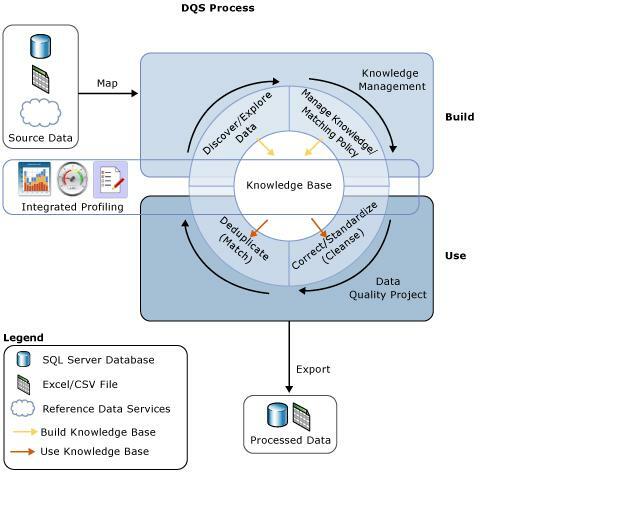 • Knowledge Base: Data Quality Services is a knowledge-driven solution that analyzes data based upon knowledge that you build with DQS. This enables you to create data quality processes that continually enhances the knowledge about your data and in so doing, continually improves the quality of your data. The capabilities afforded by Microsoft Data Quality Services addresses a critical need that exists within numerous organizations. It provides the ability to ensure the accuracy of organizational data by your staff while minimizing the time consuming setup and administration of data quality constraints. We offer the Microsoft MS10777A Implementing a Data Warehouse with Microsoft SQL Server 2012 course at our Springfield and Bloomington Education Facilities which features in depth coverage of Data Quality Services. Please let me know if you have any questions or would like to discuss SQL Server 2012 further!